The Outstanding Achievement Awards are presented annually to one student from each of the CSU system’s 23 campuses. Jeremiah Hernandez, 29, like his counterparts throughout the state, was selected for superior academic performance, personal accomplishments, community service, and financial need. As part of the recognition, he will receive a $6,000 scholarship as the state’s Michael A. and Debe Lucki Scholar. That dedication influenced ethnic studies Professor Jenell Navarro to recommend him for the statewide award. Hernandez took two courses with Navarro after transferring to Cal Poly last fall. He also works as one of her teaching assistants. The product of a working-class family, Hernandez understands that attending college is an important goal. However, life’s realities — earning a living, getting married and divorced, overcoming health challenges, and being a single father to daughter Savannah — kept him from reaching that goal for many years. 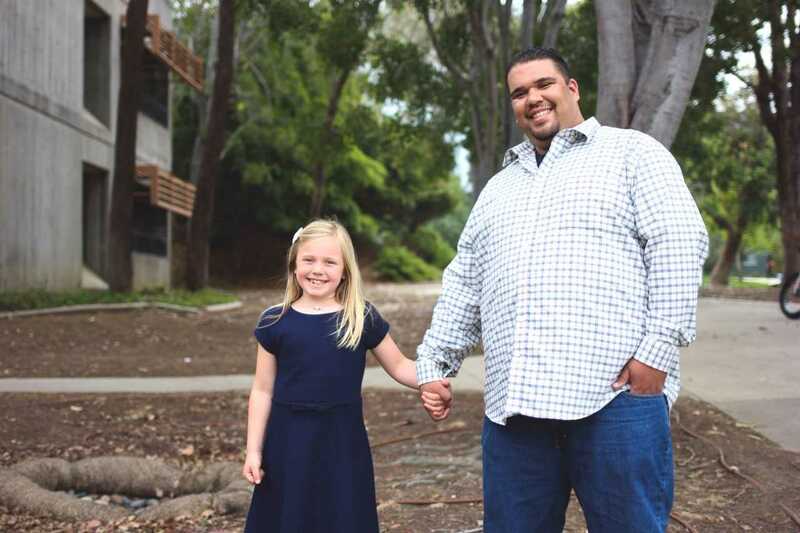 Wanting to be a positive example to his daughter, the 2006 Santa Maria High graduate returned to Hancock College in 2012 after several academic false starts — this time more determined than ever. He became a full-time student in 2014 and worked to raise his GPA from 0.4 to 3.78. The perseverance paid off. Based on his grades, leadership and community service, he was inducted into the Phi Theta Kappa 2016 All-California Community College Academic First Team. Only 30 students in the state receive the recognition out of the more than 2.4 million enrolled in California’s 113 community colleges. Hernandez graduated with an associate degree in liberal arts: social and behavioral sciences and was accepted at three CSU campuses. “I chose Cal Poly for two reasons: my daughter and being close to our family; and so I could stay involved with the community of Santa Maria,” he said. Overcoming struggles to succeed in school has inspired him to give back. Navarro said Hernandez’s “life experiences” will benefit others.